For the third consecutive time, here's an update on our record snow "experience." An area map in the Erie paper recently showed the snowfall in the city and in all the townships that surround it, over the record-setting 30 hours that have made us media stars or (in)famous stars for the 60" that was recorded at the airport. The map, however, showed that every few miles had its own total, and the airport's was far and away the most. i.e. we here in northwest Harborcreek, 13 miles east of the airport, had about 30-35" over the same time period. Don't get me wrong, cleaning off 25 cars on three consecutive days with 12" of new snow each time is enough hard work. Especially with 15-20 degree temps. Our "team" of eight sisters worked in sync with one of our maintenance guys who was driving the truck and plowing. Personally I just kept thinking of it as exercise and help in working off those delicious Christmas cookies that are everywhere! Things have settled a bit, but the cold temps are keeping the piles and piles of snow around. There are some great photos from our local Erie Times New here. Upper left: Sections and then Photos. Look for "snow"!! The Blessed Mother statue in the inner courtyard. If Sister Veronica was alive she would have covered it with a plastic bag to save it from losing its head! Lots of our bushes/trees have these large snow blobs caught on their limbs. The ever-evolving drinking fountain sculpture! See last week's entry--4 days ago! WOW! We are buried...beautiful, but buried. Stopping on the road on a snowy evening. 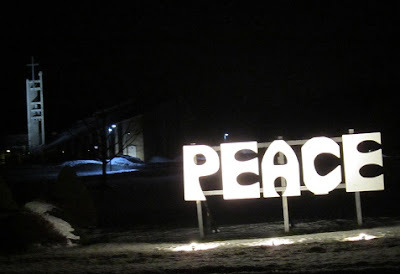 I have tried before but never really been able to capture this--our Peace sign, that we display every Advent and Christmas season, right out front along East Lake Road. But luck was with me this week when I was coming home one night, with no snow or rain falling. I just pulled over, got out and tried a couple shots. This was the best. "Let there be peace on earth." At the beginning of this week we find ourselves living in two worlds: one is the beginning of the Third Week of Advent and the other is in a semi-avalanche of nearly 2 feet of snow that has fallen in the last 10 days or so. So, as I walked down the hall from our chapel to our dining room--the closest thing we have to a cloister walk--I took a photo out every one of the five windows and caught both themes, in the inner courtyard and with the stained glass designs that hang on the windows there every Advent. Both are, of course, quite beautiful, in their own way! Well, do I have a clever, fun and welcome 5 minute relief for you--that will leave you smiling and thinking to yourself, "______ will just love this." (Fill in the blank and send it along). PS. 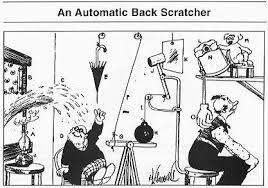 When I was growing up my Dad was the one who first introduced me to Rube Goldberg. He loved him. 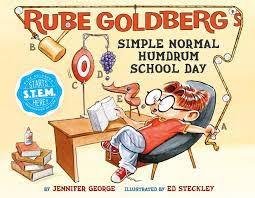 Kudos to you, Rube. See what you started! A few years ago we had a sister visiting from Australia. She had seen snow on the ground before, but had never seen it actually falling. As luck would have it, she was here for one of our first snows and she stood in amazement in our dining room as a beautiful snowfall occurred. A few minutes into it she turned to those of us around her and said, "It's not making any noise. It's perfectly silent." We didn't quite understand at first, but she explained to us that she thought it would sound like rain: tapping and clicking on windows and the ground when it hit! This weekend we had another "Aussie in the snow" experience! Our yearlong visitor, who is leaving in just a few weeks, experienced her first, live snowstorm (we had 5" in only a couple hours) and had us smiling and laughing as she related her first two experiences. The first one came when she was taking out the garbage to the dumpster (which is only 10 feet from the back door) for her dish team and just walked out in her sneakers. She was shocked when she returned and found her shoes and socks quite wet! The second was later when she ventured out for a walk and learned the word "trudge," as she found herself trudging through the snow! She told us that when she took her first step she was surprised that her foot when way down and disappeared! Then the second step did, too. I think she thought you walk on top of it! 5-8" deep by then I'd guess! We all had a good laugh, but on one thing we readily agreed: the first snowfall, large, wet pretty flakes is just beautiful. The snow was piled on the limbs of every tree, as it was on every bush and railing, bench, window sill and anything else in its path---all around, everywhere you looked. Well, this is it. After a long, warm and lovely autumn season--filled with golds and reds, browns and hundreds of different greens, the big "S" word is predicted for the weekend--even with the adjective "Lake effect." So we bid farewell and extend gratitude to our natural world for a beautiful fall this year. Halloween and Thanksgiving included--great time for friends and family to get together with zero interference from the weather--in fact, cooperation! This photo shows the effects of a bright sunset last weekend on our east end trees--talk about golden! When I was strolling around our gardens Sunday I had no anticipation of finding anything worth a photo, but I was wrong. These tassel-capped grasses are gorgeous--heavy and white and very thick. Beautiful, in that end of the season just before entering hibernation, way. Guests haven't leveled off for the winter yet, we still have quite a number. Ditto for Sunday Mass--lots of people! 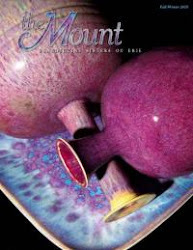 Advent is here--short as it will be this year. Here is our chapel Advent wreathe. The Pyrex stands are striking with the fresh greens in them, but the mirrors on the floor are the real eye-catchers--for the window reflections, of course! As in all Decembers, Advent is the primary "celebration" but each week seems to hold additional commemorations. It always strikes me as odd that there are so many of these in a busy enough month already. Maybe some could transfer to August! We already had, on the 2nd, the 37th anniversary of the four North American women martyrs in El Salvador. They were only in their 30s, three religious and a lay volunteer. This week brings St. Nicholas and the Immaculate Conception, religiously, and Pearl Harbor for civic remembrances. And, how could I forget? Our first lake effect snowstorm is predicted for Thursday. We get to "watch it" race across the West, Midwest, other Great Lakes, and then right onto us. Oh, joy!